Teochew porridge or ‘muay’ is so healthy that it doesn’t seem like a typical hawker dish — in fact, it’s likely as close as one will get to home-cooked food outside your home. Pretty much every food court or hawker centre in Singapore will have an ‘economy rice’ stall — a smorgasbord of meats, fish and vegetable dishes to go with a serving of rice, but not all offer porridge. The ones that do usually come with lots of healthy, steamed dishes to combine with the simple porridge. 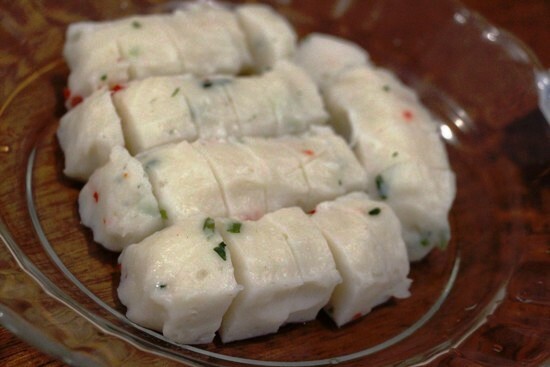 A healthy yet salty fishcake to go with the rice porridge. What differentiates Teochew porridge from the regular economy rice? The latter usually comes with rich tasting dishes, such as curry chicken and braised meats with heavy gravies, which go well with dry rice and are very filling. Porridge Teochew-style is usually very watery and light, so it goes well with steamed, dry dishes that are cooked simply to bring out the best in the fresh ingredients. The dishes are often very salty or fermented to make up for the blandness of porridge — think salty mustard greens, salted egg, salted fried anchovies and pickles. 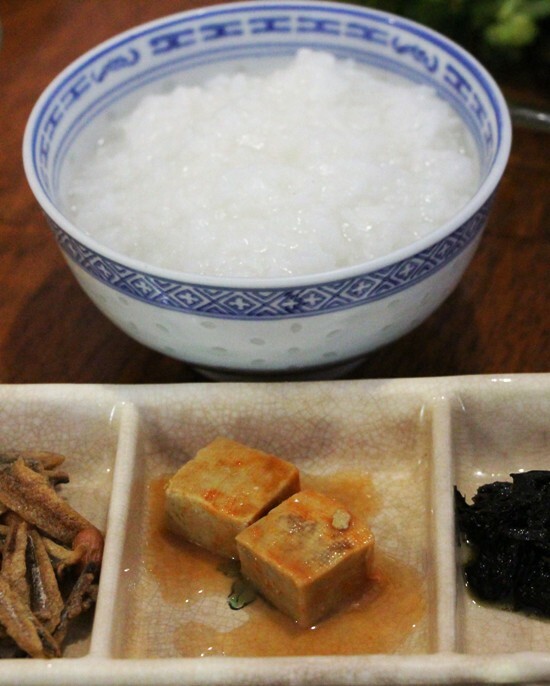 At its most basic, the light bowl of porridge is accompanied by salty and pickled side dishes. 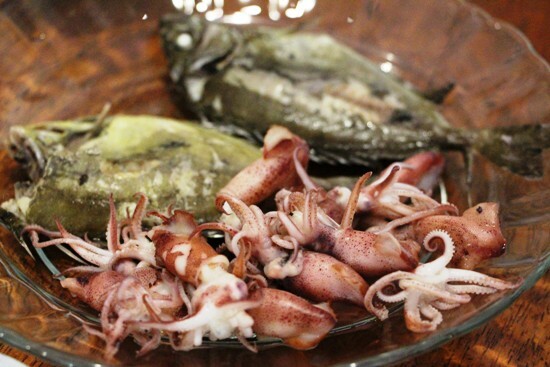 Protein options usually involve steaming — steamed squid, fish, tofu and fishcake are some typical finds, and these can help balance out the salt from the other preserved side dishes. Beyond the pickled ones, vegetable dishes of the leafy green variety are not commonly found. Read about our favourite Singapore heartland hawker centres. Good Teochew porridge stalls are popular in the mornings for breakfast, and the meal, by hawker stall standards, does not come cheap. If one chooses premium ingredients like seafood, which is usually very fresh given that there is no gravy to mask it, a Teochew porridge meal can cost upward of S$20 for two people. Some stalls even offer crayfish and crab (you guessed it, steamed). Throw in good seafood, and a Teochew porridge meal isn’t that cheap. For those who seek quantity over quality, opt for several bowls of white porridge and choose the simple vegetarian side dishes to fill you up — a budget of $6 should be enough for that. Do note that it’s best to order as a group so you get to choose more dishes. Otherwise, there are always restaurants offering Teochew porridge buffets. Teo Heng Porridge Stall: Hong Lim Food Centre, #01-25; open Mon-Sat 07:00-14:00. Teck Teochew Porridge: 300 Joo Chiat Road; open daily, but closed alternative Tuesdays, 11:00-22:00. Ah Seah Teochew Porridge: 31 Teck Chye Terrace; open daily 11:00-00:00.